We try to buy locally, and by local, I mean within a few blocks if possible. 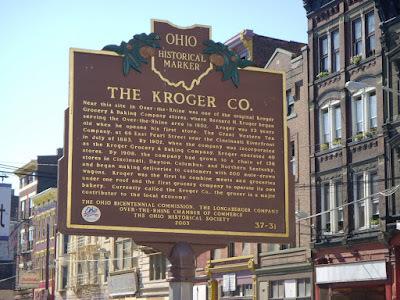 As a result I do shop at the Kroger store at 1414 Vine Street approximately monthly. Tuesday I went there. It was an ejoyable walk with great weather and meeting a few people along the way. 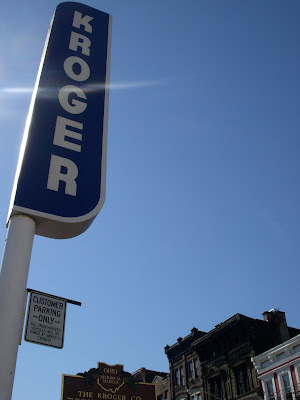 I like the small Kroger store. I may be in a minority here, but it is a decent place. Their produce selection is minimal, but I don't go there for that. This building has been a problem building for as long as I can remember. Through most of the 1990's there was the greasiest of greasy spoon diners here, "Meet and Eat". It was extremly unclean and rundown. It gives me shivers thinking about it. Currently it has one of those ghetto beeper stores that has no room for customers. When you enter the store, you are surrounded on 3 sides by plexiglass with displays of junky merchandise. There is only enough room in the store for a few customers (if they stand close together). There is a cut-out in the plexiglass for the cashier and their is a steel pass thu door on the front so you can buy stuff late at night when the owners are afraid to open the regular door. Besides beepers, cell phones and minute cards, they also sell blunts and tasty puffs, hot cheetos and other healthy snacks. The sidewalk in front of this store is the current hang-out for creeps who want to act tough, smoke dope in public and block the sidewalk. They make trying to get to Kroger's like an obstacle course. They like to keep their cigarettes hanging so you bump into them and they act like they don't see that people are trying to pass through. I have not been hassled but it does feel a bit like a gauntlet. Not sure what the solution is, but I feel the owner of the property needs to take some responsibility for his customers and the type of business he runs. According to the auditor, the owner is: Negest Mekonnen, 44 Woodstock Drive, Fairfield, OH 45014. 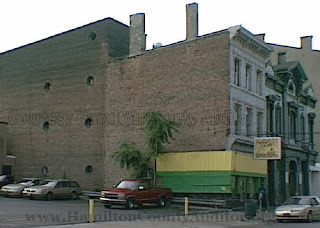 He bought the building in 1999 for $23,000. There is a 30 year TIF abatement starting 2003 (for what improvements?). You do not know what your talk about so please get your facts straight before you start blogging about something your not sure about.